Every woman has their dream wedding dress on their mind. 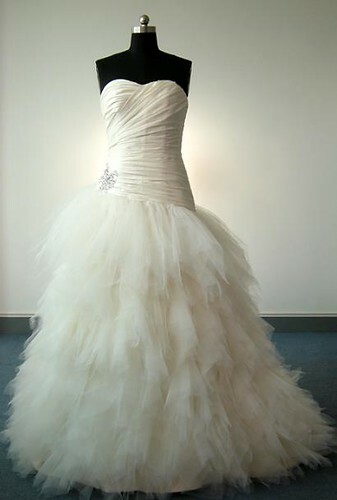 One of the best fabrics that you can use for your wedding dress is a mixture of organza and tulle fabric. Below are some ideas of couture wedding dresses. Choose the one that fits your style and your wedding theme! 1. Tube front short back long A-line wedding dress. Front short back long A-line wedding dress with asymmetric tulle skirt. 2. Simple tube wedding dress with ruffled skirt. 3. Tube front short back long A-line wedding dress. 4. Simple tube wedding dress with ruffled skirt. 5. A-line Wedding Dresses accentuate the high physique and blaze out about the waistline, which enables girls with altered abstracts to complete abbreviate silhouettes. This entry was posted on Tuesday, July 10th, 2012 at 9:13 pm and is filed under Fabrics Blog. You can follow any responses to this entry through the RSS 2.0 feed. You can leave a response, or trackback from your own site.